Good location, everything quickly accessible, much right outside the door. Our apartment offers a sleeping and retreat in Künzell, a core and suburb of the city of Fulda. Consisting of two rooms, kitchen and bathroom, spread over approx. 44m² of living space, up to four persons can be accommodated here. In the very close environment of approximately 150 to 300m offers the place numerous shopping possibilities, as for example a Penny market or an Edeka. In addition, there are various leisure activities for young and old in Künzell. The place is located with a mini-golf course (about 300m away), the Takka-Tukka-Land (indoor adventure playground for children in about 1km distance), as well as Welness offers like the spa park Siebenwelten Spa Resort, directly opposite the Takka-Tukka- Country. This invites you to sauna and relax. Kunzell also has a lot to offer for the physical well-being. Numerous restaurants and ice cream parlors can be found in our surroundings just a few hundred meters away. Visit us in a direct neighborhood Fuldas from where you can reach by bus and train not only the city, but also the Rhön. There is even a direct bus connection to Hesse's highest mountain, the Wasserkuppe with gliders, restaurants, summer toboggan run and co, which sits at an altitude of 950m above all. The central location of the apartment offers the advantage in the middle of two bus stops, which are both located in about 300m distance. The Bavarian Rhön is not far away. At the same time, there is also the possibility to look past and have a nice day, Eg on the Kreuzberg (about 45km distance). In the monastery here, the monks traditionally brew beer, which you can buy and consume naturally. There are also numerous souvenir shops and a playground. Thus the Kloster Kreuzberg offers fun for the whole family. The city center of Fulda itself is about 4.5km away and attracts with its beautiful old town, the cathedral, city castle and palace gardens. It also wades with open-air and indoor swimming pools, museums, festive facilities and an animal park. The Vogelsberg is best reached by car. This, like the Rhön, is about 20km away. Both middle mountains are framed by beautiful villages and small towns (Rhön: Tann, Gersfeld, Vogelsberg: Schlitz, Lauterbach) and offer space to discover old and well-preserved buildings. There are many opportunities for passionate hikers, cyclists and motorcyclists. The apartment offered here has about 44m² of living space with 2 rooms, kitchen and bathroom. It is located in the top floor of a residential house and offers a firm sleeping space for 4 persons. In the first room there are two beds (0. 9x2m), two bedside tables, a TV (satellite TV), a small table with 3 chairs and a wardrobe. The two beds can, of course, be put together or pushed apart. You decide, or make yourself the most pleasant. The apartment is covered with WLAN. The second room offers a bed with a size of 1. 40x2m, which offers enough sleeping space for one to two persons. Here, for example, a young couple or a sibling couple could find place. Here, too, there is a bedside table and a wardrobe (the roof window can not be opened in this room). In the kitchen you will find everything you could need during your stay. The 2 cookers, a water cooker, a toaster, mini baking oven and a microwave can prepare a variety of dishes. Of course, there are all sorts of kitchen utensils, pots, crockery, cutlery, noodle, V. M.
There is also a sink and a dining table. The bathroom has a shower / bath, a wash basin and a toilet and can be used not only for a shower, but also for a full bath. Above the sink is a small mirror cabinet for your bathroom utensils. The occupancy of the apartment is completely up to you 3-4 people. 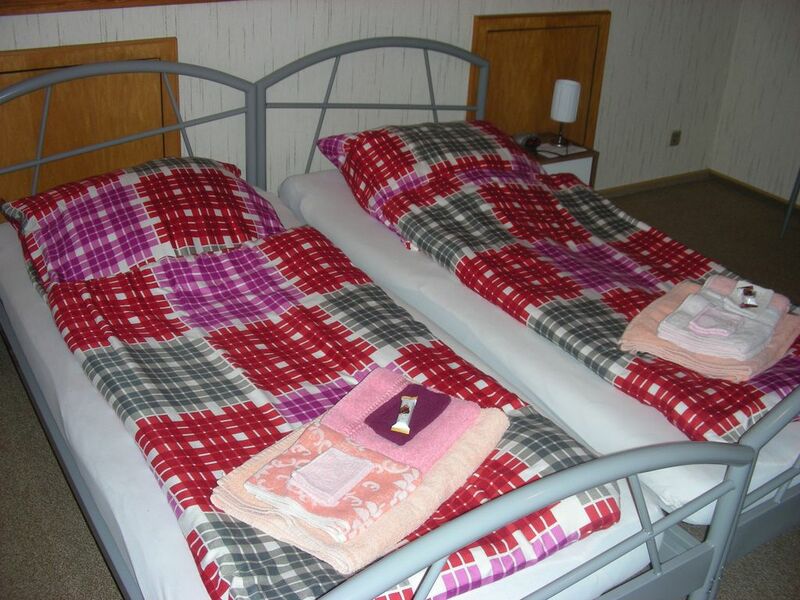 For the 4 listed sleeping places is available for free each a set of towels (1 bath towel, 2 towels) including bed linen (naturally wound up) available. You will be paid in advance either by transfer, but at the latest on the day of your arrival in cash. Arrival is possible from 2 pm. On the day of departure the apartment must be vacated by 10 am at the latest. Pets are not allowed and are not allowed in the apartment. You can reach us by phone or via e-mail or via the well-known Messenger Whatsapp for inquiries or appointments. Sink, shower bath tub, toilet, mirror cabinet, wash basin, everything you need is also available. We want you to feel good and spend a nice day. Es ist alles da was man braucht, sauber,warm und gemütlich. Sehr nett, sauber, ein top Mieter, immer wieder gerne!!! Vielen Dank nochmal das Sie sich für unsere Unterkunft entschieden hatten und auch für die Bewertung. Auch für uns war es sehr angenehm. Wir würden uns freuen wenn Sie mal wieder in Fulda sind wenn Sie sich wieder für unsere Wohnung entscheiden würden. Wünsche ihnen eine gute Zeit! Die Aufteilung in der Wohnung ist ok..Die Betten sind allerdings eine Zumutung..Bei den Doppelbett in einem Schlafraum dringen die Sprungfedern durch, in dem anderen Zimmer stehen zwei Billigbetten ohne richtiges Lattenrost mit extrem dünnen, schlechten Matratzen..Insgesamt ist die Wohnung zwar günstig, aber nicht weiterzuempfehlen..Dann lieber ein bisschen Geld investieren und die Mietpreise anheben..
Nun nochmal, wer Komfort sucht ist hier falsch, die Wohnung ist sicher nicht ungemütlich und auch nicht unbequem. Was die Betten betrifft so sagen die einen so die anderen so, man kann es nicht jedem Recht machen ist doch ganz klar. Es geht darum ihnen eine günstige Übernachtungs Möglichkeit zu bieten und das ist gegeben. Für das Geld kommt man nicht mal in einer Jugendherberge unter, aber nun gut, es wird immer Leute geben die alles schlecht reden, so macht es keinen Spaß. Wir geben uns Mühe mit der Wohnung und verfolgen den Zweck ihnen eine günstige und eigentlich auch schöne Wohnung zu bieten. Durch solche Bewertungen verliert man den Spaß und es sei immer zu bedenken wir müssen nicht vermieten sondern eben auch durch eigene schlechte Erfahrungen, eine vernünftige Wohnung anbieten die sich auch jeder leisten kann. Komfort für kein Geld das geht nun dann doch eben wieder nicht. Ihr sucht etwas günstiges und erwartet kein Sterne Hotel dann seid ihr richtig und dürft Euch in unserem Haus zu Hause fühlen. Wir freuen uns über jeden dem wir mit dem kleinen Preis eine Möglichkeit geben können zu Übernachten. Wer eine preiswerte Schlafgelegenheit in unmittelbarer Nähe zur Sieben-Welten-Therme sucht ist hier ganz gut aufgehoben. Es geht nur eines entweder preiswert wie hier geboten oder der doppelte Preis und dafür besser ausgestattet, sollte eigentlich jedem klar sein. Desweiteren ist die Einrichtung auf den Bildern zu sehen und bezieht sich nur auf einen Teil der Möbel. Wer etwas günstig sauberes sucht ist hier richtig, wer den Luxus sucht muß diesen eben auch bezahlen. Durch solche Komentare wird lediglich erreicht das neue Möbel angeschafft werden und der Preis dann eben auch anzieht, dürfte nur im Sinne einer kleinen Gemeinde sein. Günstig und gut mehr geht eben nicht. Der Vermieter sollte mal selbst eine Nacht in den Betten schlafen. Zwei Matratzen übereinandergelegt damit die Eisensträben noch so drücken. Nie wieder. Nicht zu empfählen. Schade, aber so nicht richtig, ganz normale Matratze, nichts übereinandergelegt, ausser Matratzenschoner. Betten sind immer schwierig einer sagt so der andere so. Wir würden diesen Gast sicher nicht wieder beherbergen, kann Euch nur warnen es sei denn ihr habt eine Luxus Wohnung für kein Geld anzubieten. Nie wieder!!!! Saubere zentrale Unterkunft. Gerne wieder. Visit us in a direct neighborhood Fuldas from where you can reach by bus and train not only the city, but also the Rhön. There is even a direct bus connection to Hesse's highest mountain, the Wasserkuppe with gliders, restaurants, summer toboggan run and co, which sits at an altitude of 950m above all. The extremely central location of the apartment offers the advantage of being located in the middle of two bus stops, which are both located about 300m away. The Bavarian Rhön is not far away. At the same time, the opportunity arises to look there and have a nice day. B. on the Kreuzberg (about 45km distance) to spend. In the monastery here, the monks traditionally brew beer, which you can buy and consume naturally. There are also numerous souvenir shops and a playground. Thus, the monastery Kreuzberg fun for the whole family. The city center of Fulda itself is about 4.5km away and attracts with its beautiful old town, the cathedral, city castle and palace gardens. She also wades with indoor and outdoor pools, museums, parties and a zoo. The Vogelsberg is best reached by car. This, like the Rhön, is about 20km away. Both middle mountains are framed by beautiful villages and small towns (Rhön: Tann, Gersfeld, Vogelsberg: Schlitz, Lauterbach) and offer space to discover old and well-preserved buildings. Also, there are many opportunities for passionate hikers and cyclists, as well as motorcyclists. There are also doctors and a hospital in the immediate vicinity. Es wird keine Kaution erhoben, bitte gehen Sie mit den ihnen zur Verfügung gestellten Dingen sorgsam um.